Organic farming ! What exactly is it ? My recent venture into farming provided me a great learning experience about the food that we consume every day. It also gave me an insight of what comes free with the food items from the farms that produce fruits and vegetables that we consume. Oh yeah they are good for health only if they didn't come from chemical processed cultivation. What does it mean ? I was saying if the cultivation is not done in organic method, sure it is going to create trouble by giving lots of unwanted chemicals along with the food items. So, I decided to venture the organic way of producing the fruits in my farm, the first thing is the mangos. Now the organic farm outputs are really tasty and they are healthy mangos. I spent almost all weekends in the farm harvesting the organic mangos as the summer turned out to be Mango season at my farm. 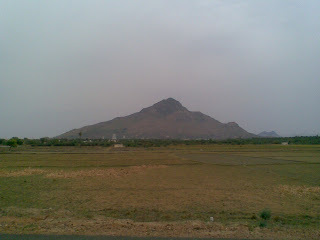 If I remember there was no single instance of fertilizers usage in this farm for the past one and half year. I strictly say no for the ripening process with Calcium Carbide, hence the natural way of ripening method is been used. I use the paddy grass with the mangos in a dark air tight room for about 3-4 days for the tasty and healthy output. 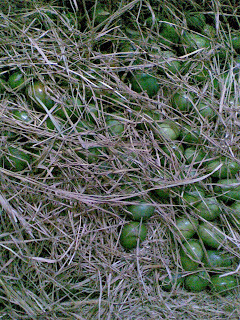 Just to make the entire process neat and to produce the mangos in a hygenic way, the mangos were handpicked personally and loaded them on my Jeep to transport to Chennai. In fact it was too tiring work as much as most body muscles needs to work climbing on the mango trees and picking them down. 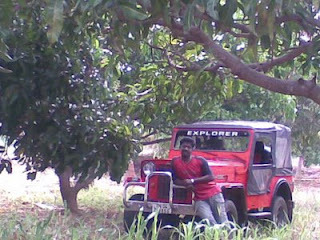 I took couple of breaks in while harvesting the mangos from tree, again the Jeep worked me as my shelter. 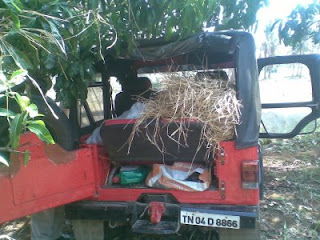 The jeep was loaded with dry paddy grass and mango bags to transport back to Chennai. Earlier week I used my Jeep with trailer as the quantity was more. Last week, The farm produced around 800kilograms of fully organic grown and rippend mangos and this week around 400kilograms. Not that the quantity is reduced, but the farm contains couple of mango varieties and they will be harvested in a time difference. Hurray! I'm supplying the organic mangos to anyone who really like natural comodities at the same price of dangerous fruits available on the market. Now I'm really proud to be a farmer. the Calcium Carbide ripening .. which is too dangerous and toxic. If anyone who reads this thread please understand not a single mango that are sold in Chennai's open market is organic and the ripening process is mainly using Calcium Carbide stones. Calcium Carbide when mixed with water produces acetylene which is highly combustible substance and when mixed with oxygen can be used for welding and cutting metals. Rather said that besides acetylene, ethylene which is also a plant hormone regulator is also produced and this characteristic helps in ripening of fruits. As the science says, Calcium Carbide is carsogenic in nature and it is not in purified form and contains traces of arsenic which too is toxic. 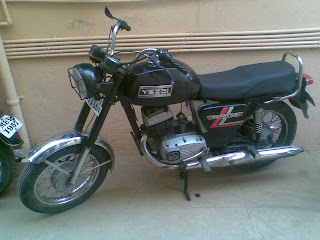 Finally the Yezdi Roadking CDI model bike has got its original beat. The bike has been transferred to Chennai from Tiruvannmalai after failing to get a lathe in my hometown to machine down the bike's cylinder. 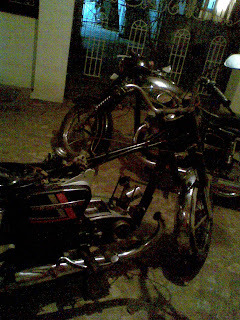 In spite of my efforts in finding all the required parts I couldnt rebore it in my hometown. 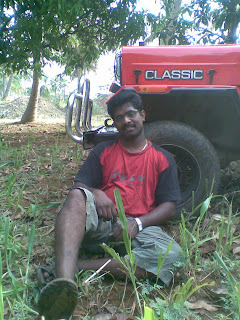 This resulted me to ask my mechanic to drive down the bike to my home in chennai and do all the work in here. 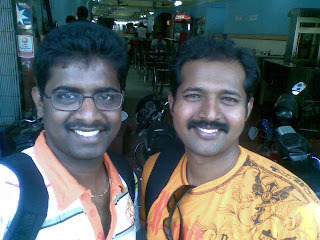 Oh yeah complete 2 days of work in chennai let the bike to be pucca. As usual our last minute was in the dark and the mechanic stayed at my house to complete the required work. Here is the completed bike's picture. 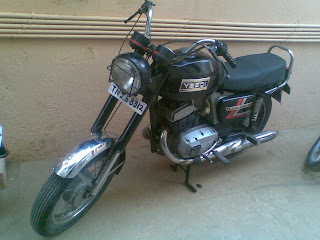 The bike got few cosmtics such as seat plate, form, foot rests and lighting set right. 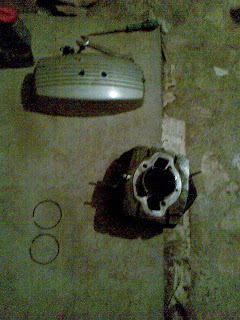 The major parts was worked out on the engine. Last week was a successful week for me in the process of my passport renewal. I have been running behind the idiots working in regional passport office at chennai for more than 3 months now. Many would have read the news about the corruption scandals about this office in the latest past weeks. I did witness lots of malfunction as the whole office is pushing people to the greatest trouble by not giving proper information and making people to come back again and again so the crowd will go for Passport Agents (brokers?) help. I was visiting atleast 8 times to make my success story, every other time either for some issue which are not related to us or their unannounced rules. For an example if you have to get tatkal passport (fresh/renewal) the govt. website claims one can pay the fee by Demand Draft or by Cash. 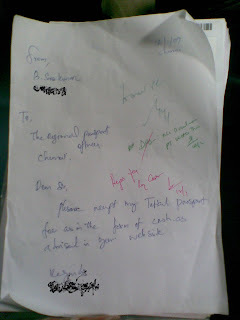 If you opt for cash and stand on the queue on appointment day, after 2-3 hours of standing on the quoue you will be asked to reappear in the queue from begining just because you dont have a DD. Though their website still claims they accept cash... my very first visit to the passport office on 12th January 2009 is for the same reason rejected. Inspite of my fights with the entire crew (even after the Regional Passport Officer who is not behind the bars) with written enquiry I was rejected on the counter. The entire office is made of anti public policies and What turned out be the final and interesting part of this passport renwal process is introduction of lots of new friends. One among was Rajvee of Sun News.. oh yeah.. I recall my family calling him with a nick name "spring neck". I didn't expect me to be on his mobile contacts... it was great to be meeting with this chap. UPDATE: Finally I got my passport renewed last weekend.